This sweeping exhibition, the most extensive ever organized on his output outside of Japan, showcases the astonishing breadth and diversity of his career in more than 500 paintings, sketches, woodblock prints, scroll paintings, albums and storybooks.2 Drawn from museums and private collections the world over, these works, many of which may never again leave Japan, highlight six key identities: Shunrō, 1778–1794; Sōri and the Sōri style, 1794–1805; Katsushika Hokusai, 1805–1810; Taito 1810–1819; Iitsu, 1820–1834; and Gakyō Rōjin Manji, 1834–1849. Curated by Seiji Nagata, an eminent Hokusai specialist and director of Katsushika Hokusai Museum of Art in Obuse, in collaboration with Laure Dalon, the Grand Palais’ assistant scientific director, the exhibition is presented in a succession of sober, subtly lit, dark-gray galleries evoking an unbroken lifeline. 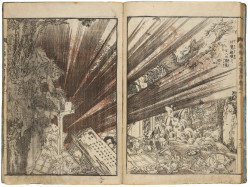 Katsushika Hokusai, Shinpen suiko gaden shohen shochitsu (The Water Margin, Illustrated New Edition of Suikoden, the first part) (September 1805), first book in a six-volume set (yomi-hon), “hanshi-bon” format, approx. 22.8 cm x 15.8 cm. Katsushika Hokusai Museum of Art, Tsuwano. ©Katsushika Hokusai Museum of Art. Little is known about Hokusai’s childhood. Born in Edo in 1760, he was adopted at age three into an artisanal family; his father was a mirror maker. He began drawing at six years old. 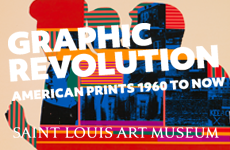 At the age of 14, he worked as a delivery boy for a lending library; at 16, he was apprenticed to a xylographer and learned the art of wood engraving. When he was 18, he was apprenticed to Katsukawa Shunshō, a noted artist of ukiyo-e (“pictures of the floating world”), woodblock prints that reflected the sensuality and hedonism of the rising middle class and its appetite for theater, wrestling, teahouses and kabuki. Shunshō was particularly adept at portraiture. 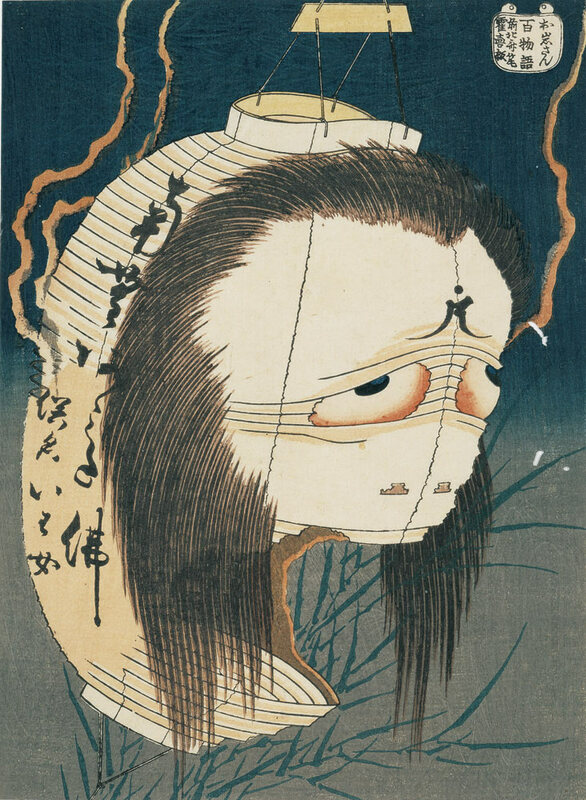 In contrast to the idealized images typical of the Torii school, his expressive portraits of popular kabuki actors, in great demand, were specific likenesses. His young apprentice excelled in his training. Within the first year of his apprenticeship, his name changed for the first time when his master dubbed him Shunrō (Spring Brilliance). In 1779, he published his first prints, a series of actor portraits, and remained in Shunshō’s atelier for more than a decade, producing single-sheet prints and illustrating novelettes. 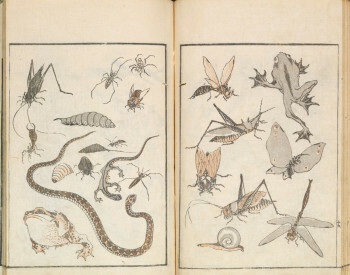 Katsushika Hokusai, Hokusai Manga (Random sketches by Hokusai), sketchbook number 1 (January 1814), illustrated book with colored woodblocks,“hanshi-bon” format, approx. 22.8 cm x 15.8 cm. Katsushika Hokusai Museum of Art, Tsuwano. ©Katsushika Hokusai Museum of Art. After Shunshō’s death, he left the atelier and began working independently under the name Sōri. In commissions for illustrated calendars (egoyomi) and lavish greeting cards called surimono, he created images of demure woman, like Japanese pinups, and graceful landscapes, as in his series “Fireworks at Ryōgoku Bridge” (1790). 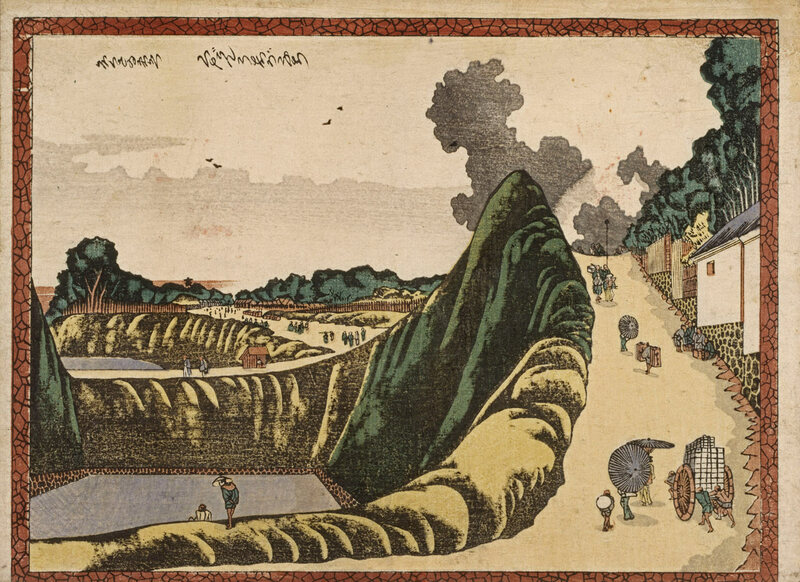 In 1800, he published his series “Famous Views of the Eastern Capital” and “Eight views of Edo.” His notoriety grew; he began to accept his own pupils and took on the name Hokusai (Studio of the North Star), perhaps alluding to his unwavering ambitions. In sensationalist adventure novels known as yomihon, individual prints and poetry albums, he began exploring Western notions of chiaroscuro, as seen, for instance, in Ushigafuchi at Kudan (1800–1804), depicting several figures strolling uphill in a summery landscape. Western influences are reflected in his palette, which corresponds to oil paint, and a thin, trompe-l’oeil wooden frame decorating the image. A consummate showman, Hokusai was also a precursor of performance art. Set up in the street, he would paint with his fingernails or an eggshell. He painted a minuscule grain of rice with two sparrows in flight; conversely, he dipped a broom into a wooden vat of ink to make a 600-foot-long portrait of a Buddhist priest. When challenged to an artistic duel, the mischievous artist prepared a large, blue panel and placed it on the ground, then dipped a rooster’s claws in red paint and chased the squawking bird across its surface, claiming its tracks depicted autumn leaves floating on a river. To attract new students, the artist now known as Taito (Polar Star) began compiling drawing manuals, starting in 1812 with Quick Lessons in Simplified Drawing. One of the show’s highlights is the enormous vitrine presenting several rows of Hokusai’s manga3 (random sketches), a multivolume compendium of impromptu drawings. 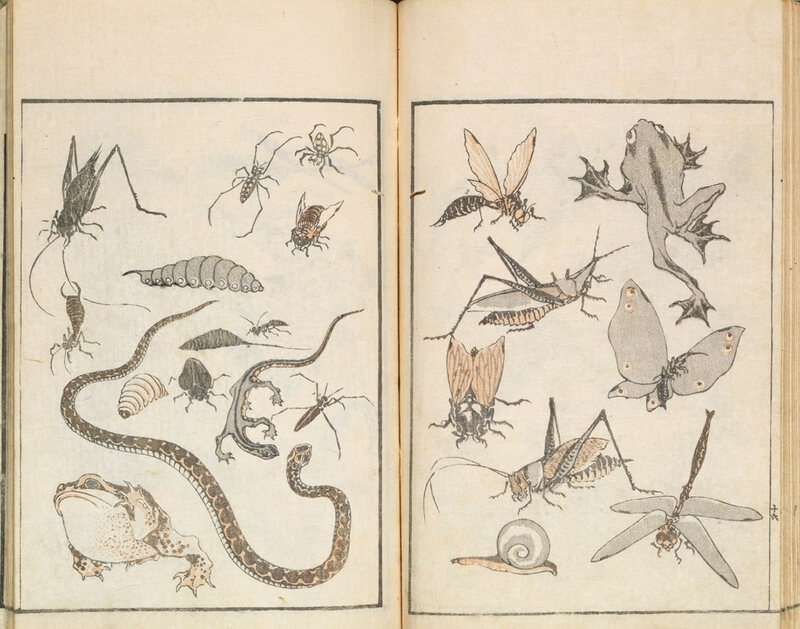 His fifteen extraordinary albums (the first published 200 years ago, in 1814, and the last published post-humously) contain some 3,900 drawings, now seen as an encyclopedia of everyday life in Japan. Keenly observed, even comical at times, these studies include insects, flowers, mythological characters and the human body in motion. Unlike his contemporaries, he gave prominence to the everyday activities of ordinary people: farmers, fisherman and servants toil, dance, eat or sleep. Katsushika Hokusai, Kanagawa oki namiura (The Great Wave off Kanagawa) from the series Fugaku sanjurokkei (Thirty-six Views of Mount Fuji) (ca. 1830–34), color woodblock print (nishiki-e), 25.6 × 37.2 cm. Koninklijke Musea voor Kunst en Geschiedenis (Royal Museums of Art and History), Brussels. ©Royal Museums of Art and History, Brussels. 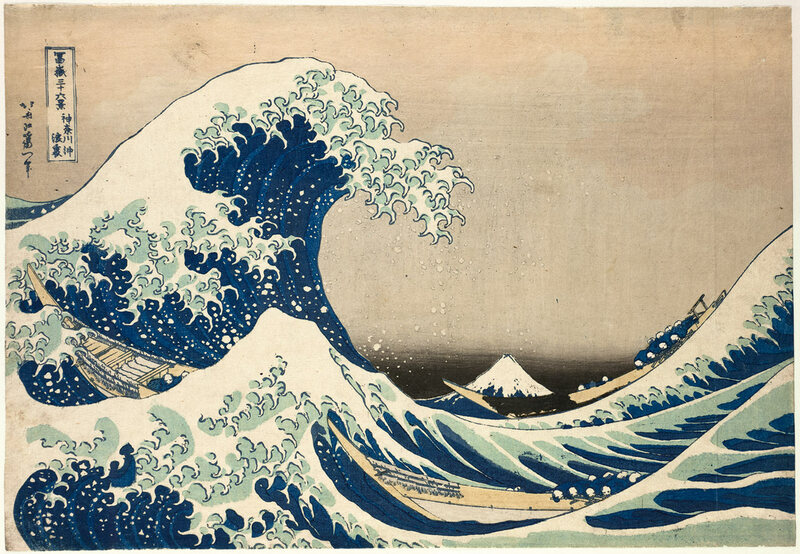 Although Hokusai suffered a stroke in his late 60s and was for a time partially paralyzed, his gifts, far from diminishing, appear to have increased. 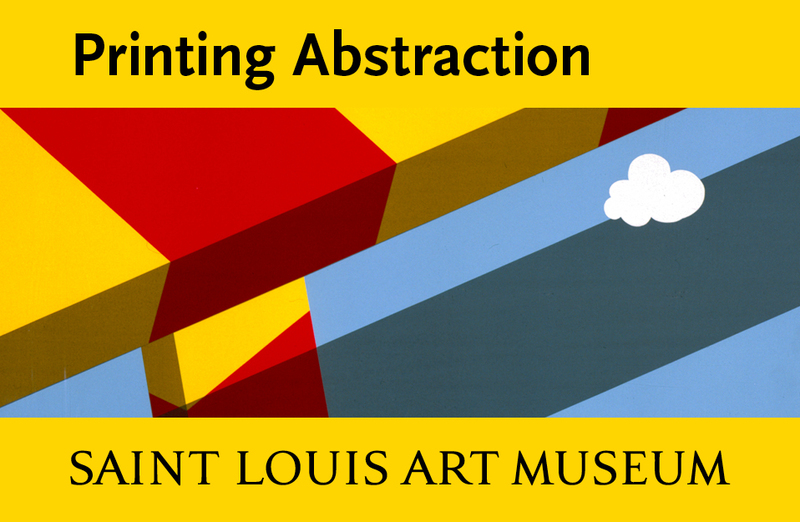 Under the incarnation of Iitsu in his early seventies, he produced the works that form the exhibit’s centerpiece, his luminous woodblock prints. 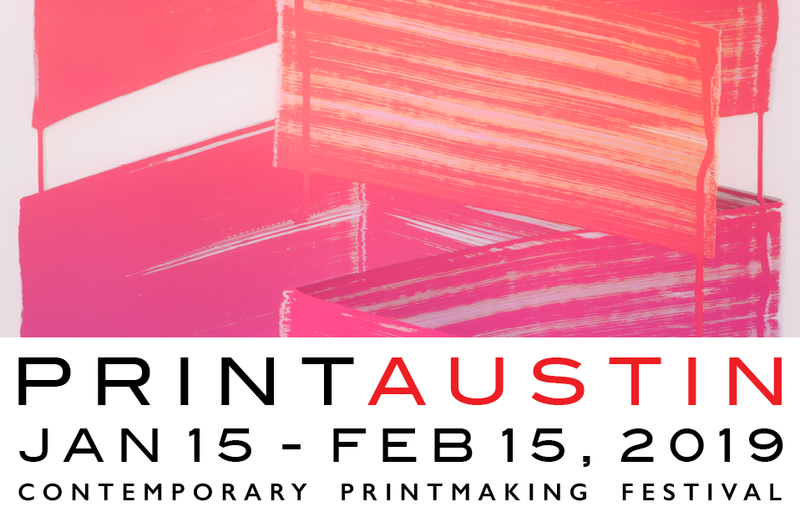 Fresh, sharp and surprisingly modern, these inventive works light up the darkened galleries. The iconic Great Wave, from his series “Thirty-six Views of Mount Fuji,” of the volcano in different weather and from various vantage points, is a portrait of incipient disaster, a threatening wave on the verge of engulfing three tiny boats, the peaked swell in the foreground and a tiny Fuji in the distance. One clearly perceives the impact of his art in catalyzing the japonisme that influenced 19th-century French artists, as well as his familiarity with European perspective and materials—the vibrant color comes from the synthetic, dark-blue pigment Berlin blue, or Prussian Blue, which had recently become more cheaply available through China. 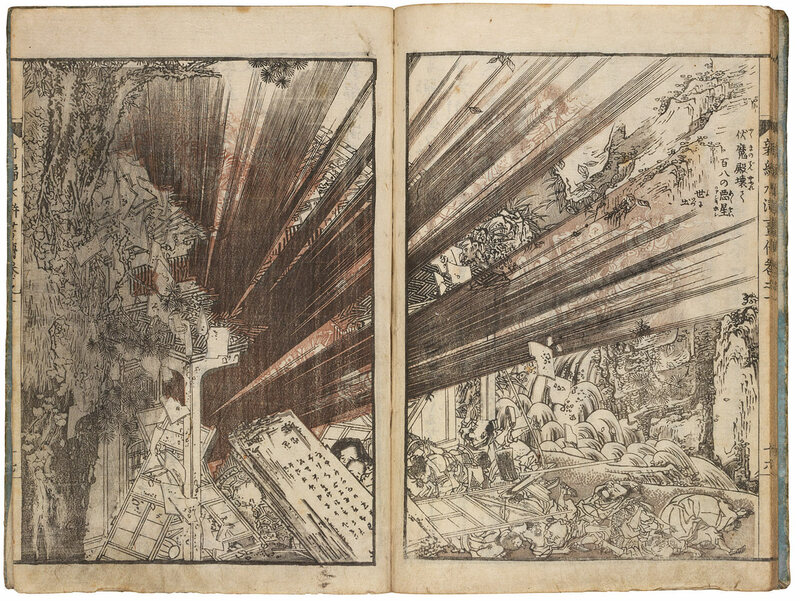 Alongside the views of Fuji, other series include “One Hundred Tales,” from Japanese ghost stories, including Hokusai’s image of Oiwa’s ghoulish face emerging from a lantern, or detailed images of flowers and birds, like the contemplative Hibiscus and Sparrow (circa 1830–1834), seemingly inspired by Flemish paintings. In the stylized “A Tour of the Waterfalls of the Provinces,” he invents new ways of depicting falling water, his white and blue vertical lines spreading out like a woman’s long hair, or tree roots. Katsushika Hokusai, Oiwa-san (The Ghost of Oiwa) from the series Hyaku Monogatari (One Hundred Tales) (ca. 1831-1832), color woodblock print (nishiki-e), 24.8 × 18.2 cm. Katsushika Hokusai Museum of Art, Tsuwano. ©Katsushika Hokusai Museum of Art.